NASA hasmade a series of critical strides in developing new nuclear reactors the sizeof a trash can that could power a human outpost on the moon or Mars. Threerecent tests at different NASA centers and a national lab have successfully demonstrated keytechnologies required for compact fission-based nuclear power plants for humansettlements onother worlds. "Thisrecent string of technology development successes confirms that the fissionsurface power project is on the right path,? said Don Palac, NASA?s fissionsurface power project manager at the Glenn Research Center in Cleveland, Ohio,in a statement. NASA?scurrent plan for human space exploration is to return astronauts to the moon by2020 on sortie missions that could lead to a permanent outpost for exploring thelunar surface and testing technologies that could aid a mannedmission to Mars. The spaceagency has been studying the feasibility of using nuclear fission power plantsto support future moon bases. Engineers performed tests in recent weeks as partof a joint effort by NASA and the Department of Energy. Nuclearfission power plants work by splitting the nuclei of atoms in a sustainable,controllable reaction that releases heat, which can then be funneled through apower converter to transfer that energy into usable electricity. A smallfission-based nuclear reactor coupled with a Stirling engine could provide upto 40 kilowatts of usable energy, enough to supporta moon base or Mars outpost, project scientists said. That?s about the sameamount of power needed to supply eight houses on Earth, NASA officials havesaid. Forcomparison, the fourgiant solar arrays on the International Space Station can generate up to120 kilowatts of usable power - about the equivalent to support 42average-sized homes. They extend from a main truss as long as football fieldand make the space station easily visible at night on Earth to the unaidedhuman eye. In one of the recent tests, Palac?s team subjected alightweight radiator panel prototype to the vacuum conditions it wouldexperience in space, as well as extreme cold (minus 125 degrees Celsius, orabout minus 193 degrees Fahrenheit). 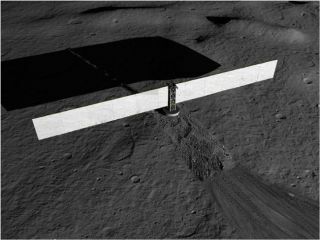 The radiator is about 6 feet wide and 9feet long, and one of 20 that would be required to keep a lunar fission reactorcool, project officials said. A second fission power milestone included pumping molten liquid metal through a Stirling engine, anengine driven by heat, to simulate how heat from a nuclear reactor could beshunted to a converter to generate power. The test was carried out at NASA?sMarshall Space Flight Center in Huntsville, Ala. The thirdtest bombarded a Stirling engine alternator with radiation, up to 20 times thecumulative dose allowed for today?s fission power plants on Earth, to see howit would hold up. It passed with flying colors, NASA officials said. Engineers performed the 26-hour endurance test at the SandiaNational Laboratory in Albuquerque, N.M.
"The pace of progress exhibited by these threeachievements in the same time period is exciting," said Lee Mason, NASA?sprincipal investigator for fission surface power at the Glenn Research Center. "It has built the team's confidence and prepared them for challenges thatlay ahead." The next step for NASA?s fission power project is to combineits radiator, engine and alternator successes into a single non-nuclear powerplant demonstration. That test is slated to begin in 2012, NASA officials said.